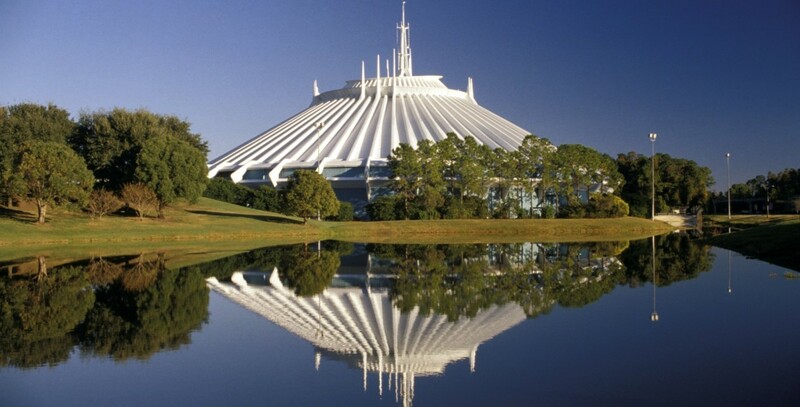 Space Mountain Tomorrowland attraction in Magic Kingdom Park at Walt Disney World; opened on January 15, 1975. Hoping to appeal to young people who like thrill rides, Space Mountain is a unique type of roller coaster. It is designed so that one rides inside, in the dark. Since you are unable to see which way the tracks are going, it is hard to brace yourself for the drops and turns, adding to the thrill. Comets, shooting stars, and other outer-space effects add interest. A moving sidewalk at the exit leads one past displays of how electronics might affect us in the future. The mountain itself is over 180 feet high, and 300 feet in diameter. Also, a Tomorrowland attraction at Disneyland; opened May 4, 1977. First sponsored by RCA at Walt Disney World, Federal Express became the sponsor in both parks from 1993 to 2003. Also a Tomorrowland attraction at Tokyo Disneyland; opened April 15, 1983; and at Hong Kong Disneyland; opened September 12, 2005. At Disneyland Paris, Space Mountain: de la Terre à la Lune opened on June 1, 1995. The Disneyland attraction closed for a major rebuild on April 10, 2003. to reopen on July 16, 2005. The Disneyland Resort Paris attraction was redesigned in 2005 as Space Mountain: Mission 2. At Disneyland the ride was transformed into Rockin’ Space Mountain for Spring 2007 featuring new lighting and technology and an all-new soundtrack. On September 25, 2009, a Halloween overlay called Space Mountain Ghost Galaxy opened at Disneyland, two years after debuting at Hong Kong Disneyland. Hyperspace Mountain, a new version in which guests join an X-wing Starfighter battle, is scheduled to be introduced at Disneyland on Nov. 16, 2015, as part of the Star Wars seasonal event, Season of the Force.